Some say that placing a filter further away from the aerial (i.e. with a reasonable length of - correct impedance ! - cable between them), particularly a Log Periodic aerial, helps with matching. I`d have thought there might only be something in that if the matching between the aerial and filter is poor to start with. However, there`s one area where performance at the boundary frequency is paramount, and that`s for 4G filtering if you happen to be on a transmitter with MUXES above about CH57. And if you`re on a transmitter broadcasting a MUX on CH60 you may have real problems because you`re wanting to receive CH60 perfectly, but filter out CH61, which is right next to it ! On the other hand, if you`re on a B group or a K group transmitter -or even better an A group transmitter - you can use a cheaper LC type filter which will work perfectly well at removing frequencies above CH60 because there`s a big gap for the filter to get it`s attenuation curve down to efficient levels. Thus it can be seen that a B group (or A group or K group) filter can make a very efficient LTE filter at a reasonable price, provided you`re on a B, K or A group transmitter of course ! Too much signal can be just as bad as too little. A television tuner circuit has an inbuilt "AGC" (Automatic Gain Control) which will generally enable the receiver to operate satisfactorily with digital signals between 45 to 60 dBμV (equivalent for analogue signals is around one millivolt up to about ten millivolts = 60 to 80 dBμV). If the signal is below this range there is a risk of digital drop outs or, on analogue, a grainy picture. Excessive signal also gives digital drop outs (or patterning on an analogue picture) via cross-modulation interference in the tuner. If one lives in a particularly strong signal area, even an unamplified signal may still be too great for the tuner to cope with. In these circumstances it is necessary to use an attenuator to reduce the input level and a variable attenuator is obviously the most useful. That said, it should be noted that a 6db & a 12dB fixed value attenuator (CoAx or F conn) then gives the option of 6db or 12dB or 18dB total attenuation and is therefore an alternative to a variable attenuator. Unfortunately, very unfortunately, many digital boxes or TVs will report poor / low signal when the actual fault is excessive signal ! If you are unsure whether you have excessive signal try an attenuator (they`re not exactly expensive......), or, if you have an amplifier in the system, try swapping it for a splitter, or bypass it but don`t just unplug it because then you`ll get no signal at all. If your aerial worked fine (to one point) on the lower power transmissions before switchover, the higher power transmissions after DSO should enable you to split the signal 4 or even 6 times and still end up with the same signal level at each TVs` input that you had before to the one TV. This is because the power was increased at switchover by about 10dB. Thus, the moral of the story is, if you`re unsure whether to fit a (passive) splitter or an amplifier/"booster" [i.e. an amplified splitter] I`d go with a splitter because you always have the option to add a one way amp in front of it if required*. On the other hand, you can`t remove the amplifier part of the amplified splitter ! ? ! * This one way amp is particularly suitable as it has a high maximum input level, switchable (high/low) gain and accepts TV, FM & DAB (handy if you have them combined in with the TV signal). 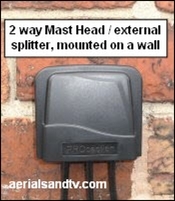 If undertaking a new installation using a splitter I`d temporarily fit the aerial to just one point. Check you receive all the channels reliably, preferably over a few days. Then add the splitter. If the signal continues to be reliable then Bingo, it`s done. On the other hand if the signal becomes problematic after putting the splitter in the circuit you then at least know that pre-amplifying the signal before the splitter (or swapping the splitter for an amp) will result in a working system. If fitting a splitter it is a good idea to buy a B to B F connector, these easily facilitate bypassing the splitter. Sometimes known as “boosters”, there are more misconceptions about amplifiers than any other area in this trade. The crucial point to understand is the difference between signal strength and signal quality. Bodging 2 cables into one aerial like this destroys what should be an impedance matched system. Any installer who connects two cables to an aerial without a splitter (or who uses an "insulation tape splitter") should get back to “The OK Corral” and do some cowboying there, and you can quote me on that. The pictures (and the graphic below) show how it should be done. Having said all of the above, as I have repeatedly stated on this site, if you live in a strong signal area (or are just plain lucky), bodges may well work, up to a point anyway, for instance, you may just get more intermittent interference. We can only advise you of best practice and then it`s up to you. A typical gain figure for a mains powered distribution amp would be around 6dB but if the amp is (say) a 4 way one must add in the loss which would occur if a passive 4 way splitter were to be used in its place (see splitters). That loss would probably be around 8dB, so the effective "gain" would actually be 8dB plus 6dB, i.e. 12dB. Many mains powered distribution amps give 12V “line power” out of the aerial input socket to power a mast head amp without the need for a separate PSU. Unfortunately it is not unknown for this to be at an insufficient current to reliably run some mast head amps and I`ve seen quoted figures as low as 25mA. Line power should be at least 50mA, and preferably 100mA. All of the 4, 6 and 8 way amplifiers we sell supply 100mA line power. Also see line power leakage issues. Some mains distribution amps have two inputs (one for UHF/TV and one for VHF/FM/DAB) which are combined together in an internal diplexer to give TV and/or FM/DAB out of all the outputs. However, not all amps, particularly older ones, accept DAB on the VHF/FM input, and, whilst on the subject, no (single input) masthead amps accept FM or DAB. So beware ! Lastly bear in mind that most mains amps do not have the benefit of variable gain and they have inferior noise figures to M/H types, so try not to put 2 in series as each amp will add some noise. ATV stock 2, 4, 6 and 8 way mains amps. All our amps are fully screened. Although doubling the signal might sound like a lot, in most instances this amplification level (as opposed to gain at the aerial) would not make that much difference to the picture, unless, by pure fluke, it is the critical amount needed to attain the minimum necessary signal level, for digital this is 45 dBμV. With analogue signals (e.g. from an RF modulator) most tuners would not improve from a poor picture to a perfect one with just a 6dB increase in signal, but digital signals can sometimes be more critical. A small improvement can sometimes make all the difference, see graph on the right illustrating the effect of the "Digital Cliff Edge". Generally, in domestic installations, amplifiers (or "boosters") fall into two basic categories, mains amps and mast head amps. The most commonly fitted are mains powered amps with relatively low gain, which are sometimes (misleadingly) called "setback amps". These tend to be used when the signal needs splitting to feed more than one set. Anyway, it`s important not to confuse the term "Sky compatible" amp. No amplifier can split/distribute a signal from a single LNB (on the dish) into a number of Sky boxes, this requires a Quattro LNB and a multiswitch. Any aerial amplifier can distribute the RF signal from a Sky box (i.e. the output from the RF2) to a number of TVs. However Digi Eyes will not work back through an amp (or, usually, any splitter) unless it has an IR return path (Digi Link). Only an IR compatible (Digi Link) amp will allow remote operation of the Sky box from a number of rooms. But if the use of remote eyes is not required then the IR return path capability of the amplifier is superfluous, see 2 above. As the name suggests splitters are used to "split" the signal from the aerial to feed multiple points. If your signal strength allows it I would generally advise the use of a splitter over an amplifier because it is simpler, cheaper, more reliable, introduces less noise and is less likely to give cross modulation problems. The latter was quite significant at DSO when the power of the transmissions was increased markedly. If you use a splitter but discover an unacceptable fall off in signal, you can always add an amplifier in front of it, a mains type like this one for internal splits (near a mains plug), or a 1 way Mast Head for external splits or where there`s no mains plug [e.g. In the loft]. Note how the Power Supply (PSU) is located inside the house. It is usually placed between an aerial output and the set it feeds, thus explaining why it is often mistaken for a “booster”. The actual amplifier has a weatherproof enclosure and is usually (but not always) placed outside, often strapped to the aerial pole. The nearer it is to the aerial (optimum distance being about one metre) the most positive effect it will have on the signal to noise ratio. That said even 3 or 4 metres is far preferable to a typical cable run of 15m, or more. Care should be taken when installing any PSU that the output is not shorted out, e.g. straight into any aerial. This can damage the unit. particularly if it doesn`t have short circuit protection. A four way mast head amp works in exactly the same way but with the PSU placed on the most convenient output (most amps have the facility for this, though not all). 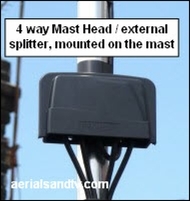 The picture above shows typical installations involving mast head (i.e. external) amplifiers. On the left we have a simple one way amp feeding one TV point, note how the distance that the weak unamplified signal has to travel is minimised, ideally about one metre. On the right is an installation utilising a four way mast mead / external amp, though in this case only three outputs are in use, thus a spare is still available if ever required. I have added an external splitter on one of the outputs simply to show that this is possible, but an additional benefit is a neater install. In fact, if it results in more elegant cable runs, and less use of cable, it is perfectly acceptable to use a one way amp near the aerial and then run into one or more splitters (external or internal) to feed the various points. Note that many people fit the mast head amps in the loft instead, if this is a more convenient location for the cable runs, e.g. through the ceiling(s). The above graphic is showing the use of amplifiers, but if you are in a decent signal area the four way amp could just be a four way splitter instead. In fact in a strong signal area it should be a four way splitter ! If you live in a strong enough signal area, then the use of a second splitter off one of the splits (as in the above right example) would be fine, despite the fact you`d only be getting half of a quarter (i.e. an eighth) of the original signal. 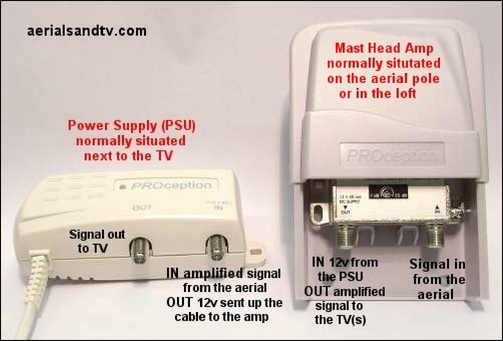 Furthermore if a PSU fails (or is omitted) the amplifier on the "mast head" (or in the loft) will be inoperative and no signal will reach the aerial point. Mast head amps are generally used in poor signal areas and they can give spectacular results provided the signal is of good quality. They can also be used as distribution amps in conjunction with splitters. 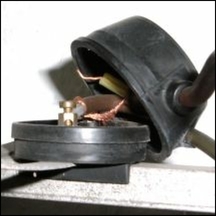 Installing the amp (or splitter) outside can often make the cable runs simpler / neater / quicker, but they can also be used in a loft where a lack of mains power precludes a mains amp. The major advantage of the mast head amp is the improvement in "signal to noise ratio" as it can be situated close to the aerial (the ideal distance is about 1m) and therefore it does not amplify any noise introduced to the signal by the cable. Mast heads are particularly effective where there is a long cable run from the aerial, and, it should be noted, even if the distance from the PSU to the amp is very long the amp will still work fine. This is because the fall off in UHF signal level per metre is far higher than the fall off in the DC voltage (typically 1V per Km for decent quality cable) required to run the mast head amp. Thus all the mast heads we sell (even a 5V one) should still work fine at well over 250m ! I am of the view that amps with variable gain capable of being decreased to a low level are more appropriate, and are more flexible in their application, than those with higher gain. All the M/H amps we sell have variable gain to overcome this problem, for instance the gain of the 4 way universal varies from 1 to 16dB. If you really feel you need more than 16dB of gain I think you want to be looking at your aerial, for example can you use a grouped one ? It should be noted that if the PSU is required to supply its voltage back through a surface plate the latter must be non isolated, because the capacitors in the isolated variety will not pass DC. Whilst on the subject of wall plates, be careful which type you fit we do not recommend budget nonscreened types, we only sell screened non isolated plates. As with amps and splitters the PSU should be of the screened type to minimise interference. Most M/H amps seem to have superior noise figures to mains types though I`m unsure why this is. Maybe it`s just because noise is more significant with a small signal (and this is what is expected with a M/H amp) so more priority is given to this parameter during the design stage(s). Note that the vast majority of M/H amps only amplify UHF, not VHF and UHF, as most of the mains ones do. If both VHF (FM/DAB) and UHF (TV) are required I recommend diplexing the FM/DAB signal in after the mast head amp, it`s highly unlikely you will significantly degrade your VHF signal via a splitter, even an 8 way. In fact amplifying FM in particular can sometimes give worse results. Finally, grouped mast head amplifiers do exist, though their use is rare now. If you aren`t getting all the channels for some unknown reason, check the M/H amp isn`t a grouped one ! The other type of amplifier is the so called Mast Head amp although this can be something of a misnomer as they are also be mounted on the wall, or even used in lofts, which can be convenient if no mains power socket is available there. These amps are powered by 12V sent back up the aerial cable by a "power supply unit" (PSU) which is plugged into one of the aerial points. These PSUs are often mistaken for amplifiers but in fact provide no amplification at all. A Diplexer is a form of "combiner/splitter" which only passes signals of certain frequencies through each leg. They are passive devices and as such don`t require any external power. Diplexers generally have a through “loss” of around 1.0 dB as opposed to that of a splitter/combiner which loses 3 to 4dB, and it`s important to remember that a diplexer or splitter/combiner loses as much when combining as when splitting (see diplexer v splitter losses : one & two). The loss figure for a diplexer will vary with the frequency, there will be a slightly greater loss “on the shoulders” of the input frequency range on each leg. For example, on a CH36 TV/TV diplexer the loss at plus + / - one channel (i.e. CHs 35 and 37) would be about 4dB (or possibly more) whereas 5 channels away (e.g. CHs31 and 41) it`d be down to approximately 1dB. At the other end of each lead, another diplexer (e.g. a setback or surface plate type) should ideally be used to split the signal back into its constituent parts [mainly because a splitter has a significantly higher through loss] but if a feed from a satellite dish is involved a diplexer should definitely be utilised. It should be noted that, if, at any particular point, only one of the diplexed frequency bands is required (e.g. only FM not TV) it is not usually necessary to use a diplexer there because the unit`s own tuner should filter out the unwanted frequencies. Whatever combination of aerials you install on your mast remember that the single most important factor is that nothing is placed in line between the reflector, the dipole and the elements of the aerial, or indeed the path to the transmitter ! See article on this subject. The graphic on the right shows a TV aerial diplexed with an FM half wave dipole. The latter antenna can give good results on both FM and DAB so the resultant combined feed can supply TVs, and/or FM tuners, and/or DAB tuners. For more DAB signal (but less FM), a DAB antenna could be substituted for the FM aerial. For maximum FM and DAB signal a triplexer could be used with separate inputs for a TV aerial, an FM aerial and a DAB aerial. We sell a CH38 TV/TV diplexers, examples of its use are shown below. Many other combinations are possible, check your transmitter`s channels/frequencies. The best way to check possibilities is using the Channel Allocation Guides (e.g. Bilsdale`s) for the transmitters for which we have a dedicated page. Note : some of these combinations may change over time due to MUXICAL chairs, also some of the esoteric lower power HD channels on MUXES 7 & 8 may not work using these diplexers. 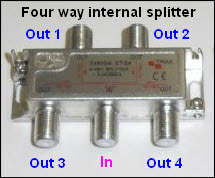 If the two transmitters you`re interested in have overlapping frequency bands, and therefore it isn`t possible to use a diplexer, you can try a splitter in reverse as a combiner or the other option is to run a cable for each aerial down to a 2 way CoAx surface plate (a decent quality screened one obviously, like this one). Use of twin cable would help make this particular job neater and quicker. Then, when you want to swap the signal from one transmitter to the other, just pull out the lead from one socket and put it in the other ! Some say terminators are hardly ever required in domestic jobs. Some say they are advisable if half (or more) of an amplifier or splitter`s outputs are unused. Some say all unused outputs should be terminated. But the one thing that everyone agrees on is that a terminator is required for the “Full Output” of a mains distribution amp (if it`s unused obviously ! ). When I did some simple tests this was certainly confirmed because omitting the terminator from the Full Output meant the amp was actually giving out less (on average) than the input, i.e. not terminating the full output effectively “lost” 6dB of gain ! A splitter on the Full Output had the same effect as a terminator, even if the splitter`s legs were unterminated. Plugging in an unterminated 30m length of cable to the Full Output resulted in the amp “only” losing 4 to 5dBdB, i.e. it had a slight loading effect. Let`s get one thing clear straight away. When we`re talking terminators we`re talking what to do with any unused outputs on an amp or splitter, it`s got nothing to do with an unfeasibly large Austro American actor. Any aerial system should be impedance matched and therefore amps/splitters are intended to work into a 75 Ohm load. On the other hand most amps/splitters are designed to accommodate a proportion of the outputs being unused without significant effects. 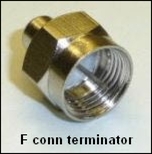 Terminators are designed to put a 75 Ohm load on an unused output of an amplifier, splitter or tap. However the situation is rather different with the unused standard outputs of a mains amp, or indeed the outputs of a mast head amp, or a splitter. In my tests the average difference (across all 11 test frequencies) between the worst case scenario (i.e. only one output of a device being used) and all being used or terminated was generally less than 1 dB. The standard outputs of mains distribution amps were least affected by lack of termination. That said, some of the frequencies had bigger differences than others. In these (admittedly simple) tests, use of terminators had an inconsistent effect on the losses of different models of splitter, sometimes increasing it, sometimes decreasing it, but always by a relatively small amount. On the other hand they marginally increased the gain of all the amplifiers. Terminators should not normally be fitted to unused outputs of IR return path (Digi Link) amps. Conclusion : If a distribution amp has a Full Output (not all do) and it is unused it should definitely be terminated. In other cases, for domestic systems, terminators are not that important, though they do have an effect on the margin. In the graphic on the right an A group aerial is shown diplexed with an E group. 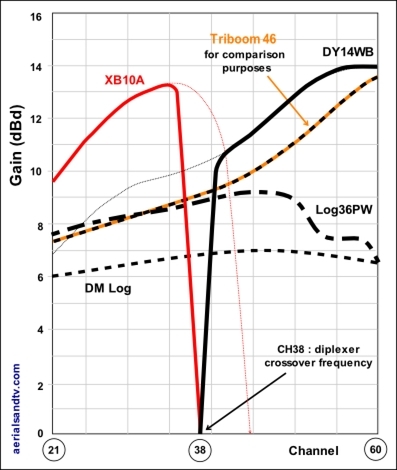 Below is a graph of the gain curves resulting from the diplexing of an XB16E with a Yagi18A using a CH21 to 37 + CH39 68 diplexer. The two aerials could be receiving from the same transmitter, or they could be on two different transmitters, e.g. the A group aerial on Crystal Palace and the E group aerial on Sudbury. See this article (written by a customer who undertook this type of install). The above graph also hints at the possibilities of using a diplexer as a filter by only utilising one leg. If using a diplexer as a filter, best practice is to put a 75 Ohm “load” on the unused leg and this can easily be added (in the form of an F Conn terminator) on the diplexers that we sell. Incidentally, when I did some crude tests on filters and diplexers I found the diplexer had a lower loss, certainly at more than three channels from the splitting frequency. 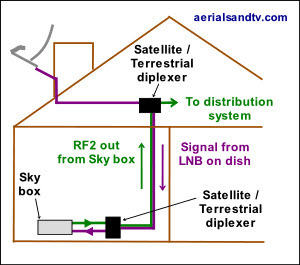 It is also possible to diplex a signal from your satellite dish with one from your TV and/or FM/DAB aerial, then, down by the TV/Sky box, this can then be split out again to feed each unit. However, it must be noted that this combined signal cannot feed multiple satellite tuners simply by splitting it. If multiple feeds from a satellite dish to a number of “set top boxes” were required it would be necessary to use a multiswitch (and a Quattro LNB) which is outside the scope of this article. The fact that a diplexer can be utilised for satellite frequency signals is one of the most significant reasons why all cabling should use decent quality satellite grade cable. You never know whether you, or someone who buys your house, will need to utilise existing wiring (possibly installed behind the wall....) to carry signals from a satellite dish. Any UHF frequency (e.g.the RF output from a CCTV camera modulator or a Sky box) can be diplexed together with a TV signal, but only if your transmitter is grouped and therefore has unused channels above or below its output, e.g. Crystal Palace or Winter Hill respectively. 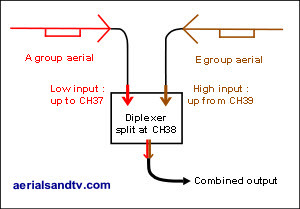 In the former case a CH38 diplexer could be used, the “added” Sky RF output being set to any channel above CH39 (though CH42 or higher will suffer lower loss). In this case the TV aerial would use the “low” input of the diplexer and the added RF (e.g. your Sky) would be connected to the “high” input”. See graphic with loft mounted combiner/diplexer. Note that it is not possible to use a diplexer like this if your transmitter is a wideband (e.g. Belmont) because using any of the splitting frequencies available would still lose some of the broadcast TV signals. Under these circumstance you would have to take your chances using a splitter in reverse, i.e. as a combiner. This does lose half the input signals and can result in signal interaction but will sometimes work fine. It should be pointed out that in the case of Sky it is far more usual to add the TV signal to the Sky RF output at the actual Sky box itself, the latter effectively has a built in combiner for this purpose. That said, if your system only has one cable from the aerial going into the loft (or wherever your distribution amp is) then using a diplexer to add the Sky output works quite well. In fact if the Sky input is on the low frequency leg of the diplexer (as it would be with Winter Hill, Sutton Coldfield or Emley Moor transmitters) then IR return path/Digi Link signals will pass (it did on ours anyway ! ) but only if the Sky box is connected to the low frequency leg. Digi link signals will not pass on the high leg. Should I fit a splitter or should I fit an amplifier ? More than one TV aerial on your house ? And finally, avoid this crap……. Two signals in opposite directions ! Typical displays from an RF spectrum analyser. Each blue waveform represents an RF transmission and this is the type of display you would get for a transmitter whose broadcast channels are “grouped”, e.g. Emley Moor (see Wright`s Aerials spectrum display of Emley Moor). Note that if an attenuator is used to reduce a signal level, or a splitter is used in the circuit (which has the same attenuating effect), the signal level and the noise level are both reduced. In actuality the S/N ratio can drop a little, but generally this is when the signal is smaller than recommended, and the further below this optimum level it is the greater will be the drop in the S/N ratio. Thus, assuming the signal is large enough in the first place, the S/N ratio (and the signal quality for that matter) will, effectively, remain the same no matter how many times a signal is split, assuming the splitters are of decent quality, obviously. Furthermore, if you have used a high gain aerial (e.g. to reduce co channel interference) and your signal level is now too high [which can give cross modulation interference] use of an attenuator will reduce the signal but still maintain the improved S/N ratio. Sky Digiboxes general information on the RF output/loop through. Selecting a frequency for your RF modulated output. Want to set up a to set up a Personal Video Recorder (PVR) or V+ box like the above graphic ? Each aerial point in the above illustrated example can receive the channel tuned in on the Sky box plus any transmission from the aerial(s). The Sky box can be remotely controlled via the Digi link eyes if required. Only three of the four outputs are in use in the system shown above. If only one additional point (the solid green leads in the above graphic) is required the connections to/from the Sky box would be the same but no amplifier would normally be required. 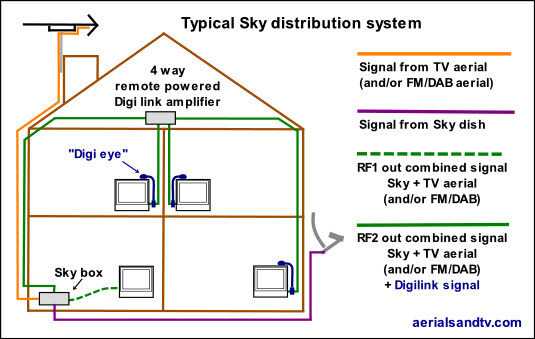 Unable to configure your system as in the graphic (possibly because the cable from your aerial only goes into the loft so you only have one cable running between your Sky box and the loft) ? See using a diplexer to add a second RF signal to the input of your distribution amp. Apart from co-channel interference issues the most common problems when setting up a Digi Link system are using isolated wall plates (we only sell non isolated / screened plates) and excessive signal from your aerial giving interference on the TVs connected to the extensions. Use of an attenuator at the aerial input to the Sky box will usually sort out the latter problem. Unless you`re absolutely certain of the signal strength in your area I`d make sure that any amp you`re thinking of using is capable of accepting a reasonably large input signal so as to avoid interference caused by overdriving the input stage. People whose aerials face the continent (e.g. Rowridge ) can often benefit from using an attenuator if (in certain weather conditions) they get excessive signal due to “lift” conditions and co-channel interference (CCI) from transmitters abroad. It must be emphasised that to have an effect on CCI (as opposed to excessive signal) the attenuator would normally be used in conjunction with a high gain / narrow beam width aerial. Another use of launch amps is to preamplify signals which are to be transmitted down very long cable runs. As an example a 100m run of cable would attenuate the signal by up to 20dB. Just like amplification, attenuation is also measured in dB, but it`s minus dB. It must be stressed that any amp in the system is just as likely to be overdriven as the TV tuner, thus if the input signal to the amp is excessive the attenuator must be utilised at this point, not just at the “setback”. That said, particularly for digital signals, there is more likely to be a problem in the TV`s tuner than any amplifier feeding it, so if you can`t get to the amp (say it`s on the roof) then try an attenuator at the set back. Incidentally attenuators are probably the most under used piece of diagnostic equipment, particularly considering they`re so cheap ! Diplexers Those in the above picture are TV/FM but we also stock TV/TV and TV/FM/DAB, though technically the latter are triplexers. Also see Separate DAB & FM Inputs On Your Tuner ? There is another category of mains amplifiers called launch or power amplifiers. These are very high gain amplifiers and they can feed multi point systems with up to 100 (or more in some cases) outputs via splitters and/or taps. They usually come in 2 basic types, wideband (where the TV/DAB/FM signals are all pre-combined), or multi input, where there are separate inputs for the TV/DAB & FM signals. Unless effective pre-filtering is used we recommend the multi input type. The latter types often have separately adjustable gain for each input, the one we stock does anyway ! Another refinement is slope equalisation, where the higher TV frequencies are amplified more then the lower ones, this is to compensate for the differing attenuations through cable and splitters over the TV band. The launch amp we sell has a maximum gain of 35dB, so its maximum output level (with a 70 dBμV input signal) would be about 105 dBμV. One can work out how many points one can feed by simple subtraction using the attenuation figures for the splitters and/or taps, also see the example in head end amps). There are other reasons why use of a filter may be beneficial. For example, you may want some unused channels on your distribution system to add a modulated RF output from your Sky or CCTV. More usually you may be suffering from transmitter overlap. 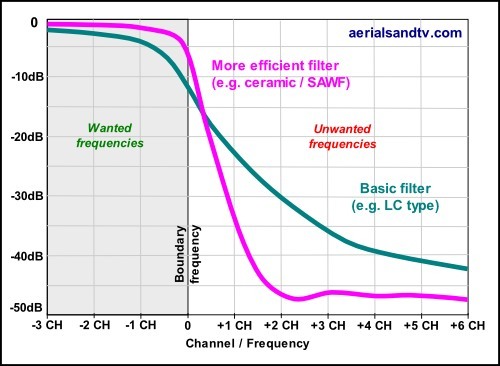 Filters can be very effective for both of these problems, but they can`t be used by everyone, if you`re on a wideband transmitter then you can`t use a filter. Even if you`re on an A group, B group or C/D group transmitter you may not always be able to use a filter to eliminate transmitter overlap. A good example of this being Mendip and Wenvoe. Close examination of Mendip`s channel allocation guide reveals that despite Mendip being a C/D group (and Wenvoe being a B) the bottom MUX on Mendip is below the top MUX on Wenvoe. So before you buy a filter examine the channel allocation guide for your transmitter ! It`s the ultimate irony isn`t it ? After years of being told that everyone should be fitting wideband aerials to receive everything from CH21 to CH69, now many people suffer from transmitter overlap and, we`re told, may suffer from filtering problems with 4G/LTE, so they now need to buy filters to remove the unwanted transmissions ! NOTE : we don`t recommend high gain wideband or E group or T group aerials with built in 4G filters, for the reasons see this article. We don`t recommend the use of "budget" unscreened wll plates. View of the actual diplexer from the above surface plate. Note how there is only a terminal for one cable (clamp removed for clarity) and also the use of a screening can. 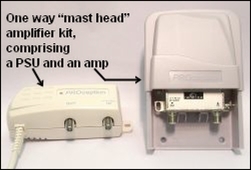 “Mast Head” diplexer with the front door of the weatherproof enclosure removed for clarity, the unit can also (for example) be screwed to a wall. The left hand connector is for TV/UHF in and the right hand one for FM/VHF/DAB whilst the middle one is the combined output. Note the use of a screening can. with our diplexers, splitters or amps. Assuming the downlead is OK (plus any wall plate), the only way to improve signal quality is at the aerial, either by changing its location/direction or by using a higher gain antenna. If one has a good quality signal but it is of small amplitude (hence the term amplifier) then an appropriate amp (particularly a mast head amp) can work wonders for picture quality. On the other hand if the signal is of poor quality and one adds an amplifier it will give no improvement. All you will get is a large poor quality signal, as opposed to a small poor quality signal ! 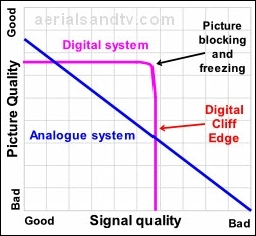 It`s not quite as simple as the above graphic shows because a low "signal to noise ratio" (or SNR) can also give digital picture break up or a low gain (snowy) picture on an analogue signal. Note how, in the graphic below, only a higher gain aerial has a positive effect on the SNR. The noise referred to is background RF (Radio Frequency) noise which is around us all the time. represent the load on the signal, it is irrelevant whether or not there is a TV on the end. If mounting a splitter on the wall and tapping into a pre-existing downlead you should bear in mind the cable you`re splitting off from will need some slack in it for the cable to divert over and into (then out of) the bottom of the splitter. If you don`t have any slack use a cable joint kit to add additional cable as required. All the mast head products we stock come with a strap (to attach to the mast) but personally I`d always tape them on as well, just in case the tie wrap breaks. These external (mast head type) splitters are equally suitable for mounting on the wall or the aerial mast according to which is more convenient. All our splitters are screened and any F connectors required with our splitters (or amps) are included in the price, and they`re decent ones ! The loss through a 2 way splitter is about 3 to 4 dB (for UHF) and most locations can accommodate this with no problems, in fact if you have decent signals even a four way (or even an 8 way) should be fine. Remember you are only losing signal level, the quality should be exactly the same on the split signal. If you use a splitter and then find unacceptable signal degradation it`s fine to just add an amplifier before the input to the splitter. Note that for some CoAx splitters it does matter which way round they`re fitted ! For a 2 way splitter on VHF (FM/DAB) the loss would be about 3dB. For a 2 way split at satellite IF the loss would be about 5dB at 1MHz (the bottom of the IF frequency range) and 6dB at 2GHz (the top of the IF frequency range). A splitter should always be used because just "splicing" the aerial downleads together is very bad practice from both weather proofing considerations (if it`s mounted outside) and the signal point of view. Aerial splitters are designed to maintain a 75Ω (Ohm) "impedance matched system", this maximises signal transfer and minimises the chances of reflections of the signal back up the cable. All TV tuners are designed to work with a 75Ω load, all TV cable should be 75Ω and all decent aerials are designed to have (as close as possible) a 75Ω impedance at the dipole or balun. Other bodges include using a plain junction box of the type utilised for mains wiring (not that they`re screened anyway, so that`s a particularly big no no) or fitting a "one in two out" budget wallplate plate. Also see 50 Ohm / 75 Ohm impedance mismatch loss. Indoor splitters are available in 2 way, 4 way, 6 Way and 8 Way. Using a splitter will obviously only supply proportion of the signal out of each leg, but so long as an adequate signal is present at the input, it is quite acceptable to split the signal 2, 3 or 4 times (or even more). The crucial point is that there is still at least 45 dBμV of digital signal at each TV tuner input. In strong signal areas we have split unamplified signals up to eight ways with no problem at all. If it is more convenient, a powerful one way masthead amp can be used as a “head end amp” and the signal then split where it is required. If using the latter technique remember that power pass (enabling the 12V for the masthead amp to pass through the splitter to the M/H amp) considerations must be satisfied. All the splitters we sell (except the Co Ax splitter) enable power pass. If using a “head end amplifier” with the splitter located at a more convenient location one can work out the nett amplification quite simply by taking the dB loss of the splitter from the dB gain of the amplifier. For example if one uses a 22dB gain Mast Head amp feeding a 6 way splitter (with a loss per output of 10dB) one still has a nett amplification of 12dB. Commercial systems use the same principle to feed up to 100 points (or more) by using launch amps with very high gain (e.g. 35dB) feeding splitters and/or taps. Even using a relatively small head end amp of say 35dB one could feed an 8 way splitter (loss 12dB) which could then feed 8 more 8 way splitters (at another loss of 12db) which still gives a nett gain of 11dB (less cable loss) at each output. 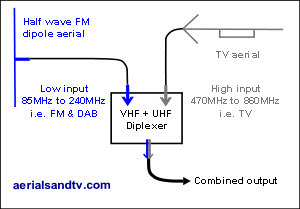 Perhaps the most common use of a diplexer is to combine the signals from a UHF(TV) aerial and a VHF(FM+DAB) radio aerial onto one downlead, but note that not all diplexers accept FM and DAB signals, some have a filter and only accept FM or DAB. If required, this diplexed signal can then be fed through a distribution amplifier (or splitter if sufficient signal is present) to feed more than one point, but remember most mast head amps are only UHF compatible. Since it is rare to have to amplify FM (or even DAB) in order to split it our advice is to diplex the FM/DAB signal in after the TV mast head amp. In fact amplifying FM in particular can sometimes give worse results. If your mains distribution amp has separate FM/TV inputs (like our 4, 6 and 8 way amps) it already has a diplexer on the input. This is an important point because if you feed a combined FM/TV signal into the TV input the amp will only “accept” the TV component ! Furthermore not all models of amplifier which have TV/UHF + FM/VHF inputs will accept DAB on the latter input, the ones we sell do accept DAB. Incidentally when we checked the output of a Sky receiver with a spectrum analyser, it did pass FM & DAB, and they both emerged from RF1 and RF2. This information could be significant when planning your system. It may come as a surprise but using diplexers you can send two signals in opposite directions down the same cable (which is effectively what`s happening with the IR return/Digilink system). If you think about it this is no surprise because the signal isn`t DC, it`s AC and at different frequencies (as opposed to AC at the same frequency). What`s more loads of RF frequencies are flying about all round us and it all works swimmingly, but again, only if they aren`t the same frequency (or you`d get co-channel interference). As an example you can send a TV (or FM or DAB) signal one way and a satellite signal the other using two UHF+ VHF/Satellite diplexers. Alternatively, using two UHF/UHF diplexers, you can send a modulated signal (e.g. from a Skybox or a CCTV) one way and the signal from your aerial the other way, although it should be pointed out this can only be done if you`re on a grouped transmitter [if relevant see this article for Digilink implications]. In fact you could probably send signals in opposite directions using two splitter combiners but the losses would be greater and diplexers are filtered for the correct frequency range*, which is why I only bothered playing about with diplexers when I proved this two way traffic theory to myself in Sept 12. * Which is why it`s preferable to use a diplexer to add to a modulated RF signal to a system as opposed to using the AUX input on a loft box or launch amp. It`s like magic isn`t it ? ! ? In this example we`re sending a satellite IF frequency signal one way (down from the loft) and a UHF signal (in this case the RF2 output from a Sky box) the other way. An additional refinement of this is that the Digilink (IR Return) system will still work but only if the distribution amp is mains powered (like this one) as opposed to one which is remote powered by the Sky box. The reason is that the diplexer can only have power pass on the satellite leg if the LNB switching is to work correctly, thus the voltage sent to power the eyes (or the remote amp) can`t pass on the UHF leg. However, the IR return signal can pass, so we just need to add the voltage for the eyes from the mains powered amp. One should also bear in mind that all amplifiers introduce additional "noise" to the signal and this should obviously be as little as possible. However, there is a trade off between amplifier power and noise. As a general rule the more powerful the amplifier (a launch amp for a big system being a good example) the higher the noise will be. But, if you think about it, a higher noise figure on a powerful amp is less important anyway because the total signal is so large. A 100 dBμV signal is not going to be as affected by an extra 3dB of noise as much as a 45 dBμV signal that a mast head amp might have to deal with be. Noise figures should be around 3dB (or less) for a mast head amp, 4dB for a mains type distribution amp, or 6dB for a launch amp. Wherever possible an amp should have variable gain and generally speaking the gain control should be turned down as far as possible to achieve the desired results, doing this will help to minimise cross modulation and/or co-channel interference. There are two main types of variable gain control, front end (generally a variable attenuator on the input), and interstage, where the signal level is altered after initial amplification. The latter is preferable as it gives better noise figures at minimum gain settings. A variable gain facility was particularly worthwhile when the transmitting power was increased at DSO, see this customer report. For this kind of problem our 4 way M/H amp is particularly well specified as it turns down to only 1dB. Also see should I fit a splitter or an amp ? Finally all amplifiers (or splitters) should be "screened" to help eliminate interference etc. signal quality can be achieved, see this aerial report. * It`s very rare to require two aerials on the same transmitter, though it`s slightly less rare to have two aerials on two different transmitters, often diplexed together. This may be to receive different local news or because the different transmitters give better signals on different channels. I know that looks are subjective but I feel I would be on pretty safe ground if I were to say that these installs (and those under Deforestation Required ! ) were “aesthetically challenged”. As revealed in the paragraph above, it is not necessary to have carbuncles such as these on your house when the use of a splitter or amp would obviate it. Talking about taps and not a plumber in sight ? The explanation is that a tap is a type of splitter *. However, there is a significant difference between a splitter and a tap, the latter don`t evenly split the signal between the outputs. 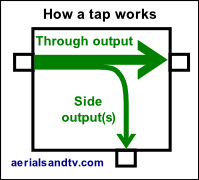 In fact, when it comes to taps, it`s all about the proportion of signal supplied to the main "through" output on the one hand, and to the "side" output(s) on the other. Thus there are 2 loss figures quoted for a tap, its through loss, and its side loss. As an example a 12dB / 1.7dB tap would attenuate the side output(s) by 12dB, but the through output by only 1.7dB. All this apparent complexity does have benefits though. Say you have an output from a one way mast head amp into the loft where you want to feed one point, then you need to feed an 8 way splitter at the other end of the house. 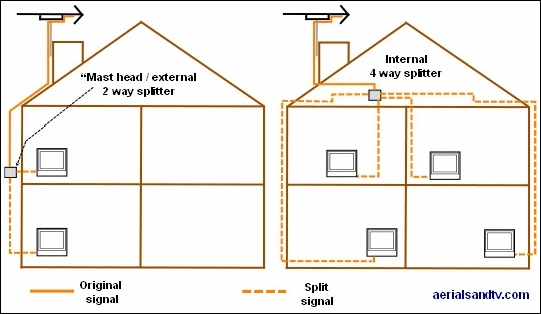 Since an 8 way splitter would have a loss of 12dB, (plus the cable losses), a 15dB/1.2dB tap would be ideal because it`d feed the single point from its side port, then run the through outlet down to supply the 8 way splitter. * Considering taps as a form of splitter is actually a bit simplistic because taps are internally very different from splitters. Taps have a higher return isolation than splitters, so some people say it`s technically beneficial to incorporate taps, or a mix of taps and splitters, into a system. Others say that taps have inferior impedance matching to (decent) splitters, so they only use them when they have to [particularly for satellite work], and then they try not to use more than one in series. I`d have thought that for most people there wouldn`t be much of a problem either way, especially for UHF/VHF work. Filters should only let through signals of a certain frequency and, hopefully, reject all the others. Now this sounds simple enough, and it usually is, apart from near the edge of the wanted/unwanted frequency band. This is because no filter can give high rejection of one frequency and at the same time let through all, or even nearly all, of other very close frequencies. Some amps have an “IR (infra red) return path”. Sky boxes can be remote controlled from different rooms utilising “Digi Eyes” (next to the TVs) which pick up the remote commands and send them back down the CoAx cable [at 5 to 40MHz] to the RF2 output of the Sky box. An IR return path amp (or “Digi Link amp”) allows the passage of these remote control signals. Note ! From August 2013 the boxes supplied by Sky do not have an RF2 output (don`t you just love Sky, not) so you`ll need to buy an IO Link adapter to restore Digilink functionality. Furthermore the Sky box will not supply enough current (via the I/O link) for a remote powered amp [if you`ve got one of the latter] and for these to work require an external power supply. This is all a PITA, but, to be fair, at least you can still get the Digilink working, you can`t (not easily) with Virgin or BT etc….. The amount of amplification given to the signal by an amp is measured in dB = decibels. In the RF reception game plus 6dB is double, and minus 6dB (i.e. attenuation) is half. 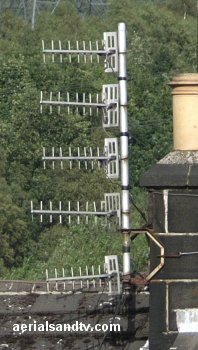 More rarely a diplexer can be used to combine the signals from two TV aerials, though do not confuse this with a “phased array”. 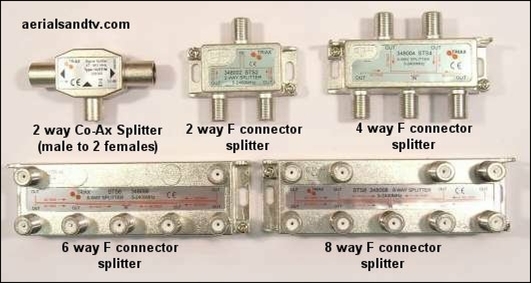 Although it is possible to just use a splitter "in reverse", there is the possibility of signal interaction or ghosting and in addition the loss on a splitter type combiner is significantly higher than on a diplexer, in fact one loses the same amount of signal using a splitter as a combiner as one would using it as a splitter ! Anyway, you may be in a situation where you can get some MUXES OK off one transmitter, but some of the others better off another, or you might want the local news off a different transmitter than the one you normally get the best signal from *. Alternatively you may be in such a poor spot that at different times of the year the best signal is off different transmitters, trees are the most common cause of the latter. If the two transmitters outputs do not overlap in the band, and a diplexer with a suitable splitting frequency is available, both aerials outputs can be combined onto one downlead. * For people only requiring one specific MUX from a different TV transmitter (e.g. the one with the local BBC news on it) many more combinations of aerials can use the CH38 diplexer. Resultant curve(s) from diplexing an A and a wideband aerial. This is became of more interest when MUX 7 & 8 were moved out of the A group on Crystal Palace and Rowridge etc !